Proposed tower and berm structure by Ronald Kasprisin. Image courtesy of the Washington Emergency Management Division. CAMP MURRAY, WASHINGTON- When natural disaster strikes, most of us instinctively run for the hills. But what if you live in the flats, and can’t outrun or even out-drive a fast-approaching tsunami wave? The low-lying coast on the west coast of Washington state is one such region. 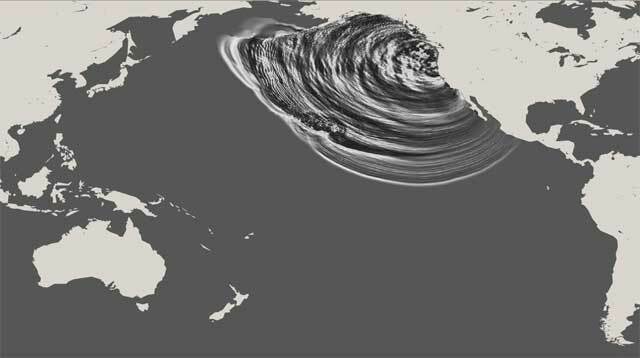 Residents face both the risk of a major earthquake from the Cascadia fault, and tsunami waves predicted to pummel the shore only 30-40 minutes after the quake. John Schelling, Earthquake Program Manager at the Washington State Emergency Management Division, claims that when a tsunami is approaching, residents need to be prepared to evacuate—vertically. Schelling worked with a team of engineers to plan a series of towers, buildings and berms to provide a vertical escape option that is easily accessible and can withstand the massive force of a tsunami. The proposal, dubbed “Project Safe Haven,” is well underway in Washington’s coastal communities, including Ocean Shores and Westport where community members have come together to figure out what “heading for higher ground” will look like for them. But there will be much more physics and engineering going into these buildings than meets the eye. 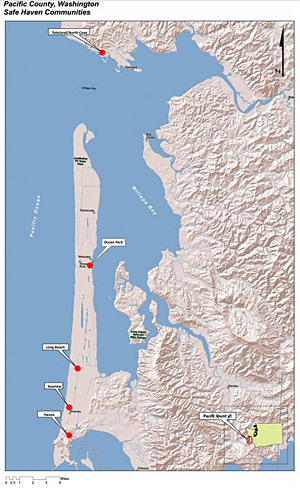 Locations on Washington coast for proposed vertical evacuation structures. Image courtesy of the Washington Emergency Management Division. Designing a structure to withstand an earthquake of that size is a task in itself, but these buildings and towers will also then need to withstand the force of the approaching tsunami wave. The engineering answer to this challenge? “The ground floor would be sacrificial, the walls are designed to wash away, and allow water to flow in and out,” says Schelling. Meanwhile, the top floors, where the evacuees would be gathered, are left intact. 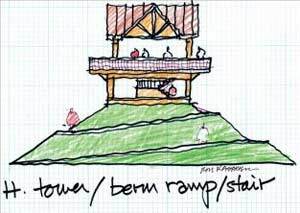 It’s a different design concept than berms which are essentially small, hollow hills that can be easily accessed, including by those people who may have trouble quickly climbing to safety in towers or buildings. These structures will be strategically placed throughout the communities most vulnerable to a tsunami. The goal is not only to get as many people to safety as possible; it’s to get as many people to safety as quickly as possible. While the berms would have the largest foot print on the landscape, they will be able to hold anywhere from 100 to 10,000 people above the water. The outer mound will be constructed from soil to provide a natural slope that can easily be climbed. Schelling says the inside will be a “reinforced concrete core” to keep the berm from collapsing during an earthquake and steady as the tsunami waves hit the coast. The other benefit to berms is that the mound of earth, similar to the one in Gasworks Park in Seattle, can provide safety without looking too man-made and disrupting the natural environment. “It’s designed to blend in and provide a nice aesthetic to the natural and built environment that people love about the coast,” says Schelling. For these safe havens, the sky is the limit. Colette Kent, intern at KCTS 9 and student at George Washington University, contributed to this blog.